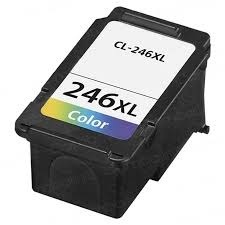 Canon MG2522 ink cartridges and supplies. Guaranteed quality, discount-pricing, and same-day shipping! Remanufactured Canon Ink Cartridge, Color, High Capacity, 300 page yield. Replaces Canon part number: CL-246XL, 8280B001AA. Ink Cartridge compatible with Canon PIXMA MG2522. Remanufactured Canon Ink Cartridge, Black, High Capacity, 300 page yield. Replaces Canon part number: PG-245XL, 8278B001AA. Ink Cartridge compatible with Canon PIXMA MG2522. Genuine OEM Canon Ink Cartridge, Color, 150 page yield. Canon part number: CL-244, 1288C001, 1288C001AA. Ink Cartridge compatible with Canon PIXMA MG2522. Genuine OEM Canon Ink Cartridge, Color, 180 page yield. Canon part number: CL-246, 8281B001AA. Ink Cartridge compatible with Canon PIXMA MG2522. Genuine OEM Canon Ink Cartridge, Black, 150 page yield. Canon part number: PG-243, 1287C001, 1287C001AA. Ink Cartridge compatible with Canon PIXMA MG2522. Genuine OEM Canon Ink Cartridge, Black, 180 page yield. Canon part number: PG-245, 8279B001AA. Ink Cartridge compatible with Canon PIXMA MG2522. Genuine OEM Canon Ink Cartridge, Color, High Capacity, 300 page yield. Canon part number: CL-246XL, 8280B001AA. Ink Cartridge compatible with Canon PIXMA MG2522. Genuine OEM Canon Ink Cartridge, Black, High Capacity, 300 page yield. Canon part number: PG-245XL, 8278B001AA. Ink Cartridge compatible with Canon PIXMA MG2522. Genuine OEM Canon Ink Cartridge Bundle Pack, High Capacity, 300 page yield. Bundle pack includes: one Black (PG-245XL), one Color (CL-246XL) ink cartridge. Canon part number: 8278B005. Ink Cartridge compatible with Canon PIXMA MG2522.